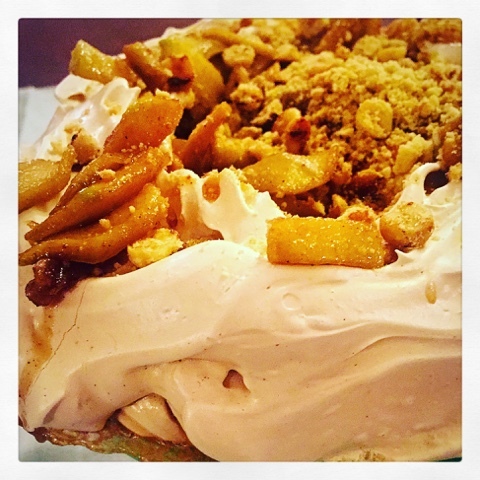 I love a good pavlova but do find it more of a summer pudding, so I was racking my brain how to make it more seasonal. Anyway this is what I came up with. I really hope you enjoy this recipe. Please do use the side bar to share if you enjoy it. In a spotlessly clean and dry bowl, whisk the egg whites to medium peaks. Gradually add the sugar until incorporated and the meringue is thick and glossy. Spread the meringue into a round approximately 8 inch in diameter on the prepared baking sheet. Bake for 3-4 hours until the meringue is pale and crisp. Leave to cool completely in the oven. Heat half the butter and all the brown sugar in a frying pan until bubbling, add the spice and apple slices cook until soft. Leave to cool completely. Rub together the remaining butter, sugar and flour until you have a bread crumb constancy. Spread onto a lined baking tray with the hazelnut halves and bake @170 for about 8-10 minutes until golden. Leave to cool. Gently whip the cream until you have soft peaks, fold through the custard. Just before you're ready to serve, spoon the cream custard into the centre of the pavlova, spoon over the apples then sprinkle on the nuts and crumble.